OXFORD, Miss. — An excited Ole Miss Rebels football team took the field against No. 1 Alabama at Vaught-Hemingway Stadium Saturday, and on the first play from scrimmage wide receiver D.K. Metcalf caught a 75-yard touchdown pass from quarterback Jordan Ta’amu. The 11-second, one play scoring drive sent a shockwave throughout the Vaught–but, unfortunately, that was the only time the Rebels would find the end zone before ultimately losing 62-7 to the Tide. Three plays after the Rebels’ score, Alabama running back Damien Harris scampered for a 43-yard touchdown to even things up with 13:39 left in the first. After that, the Tide began rolling and did not stop until the game was over. By then they had amassed 516 yards of total offense (306 passing, 210 rushing). 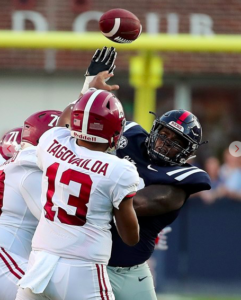 In his post game press conference, Ole Miss head coach Matt Luke expressed disappointment at the outcome but said he and the team will move forward and learn from their mistakes. “We cannot let this one game beat us twice,” Luke said. “It’s just one game, one of our twelve opportunities,” he added. Alabama quarterback Tua Tagovailoa looked sharp, completing 11-of-15 attempts for 191 yards and two touchdowns. He also rushed for 47 yards. At 35-7, midway through the second quarter, backup QB Jalen Hurts entered the game and completed 7-of-10 passes for 85 yards, two touchdowns and one interception (C.J. Moore). Offensive coordinator Phil Longo was frustrated after the loss and said he “expected a better performance” from the Rebels’ offense. 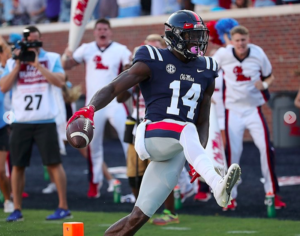 In the first two games of the year, the Ole Miss offense scored 47 and 76 points, respectively. However, the offense was unable to get on track following the initial touchdown. Ta’amu completed 7-of-22 passes for 133 yards and one TD. He suffered two interceptions, one of which was a pick-six when the game was out of reach. Ta’amu emphasized the importance of shaking this loss off and having short-term memory heading into practice and the next game–and he vowed not to have this type of game again. Ta’amu never left the game for the Rebels–even though his teammates were being substituted around him. He explained his desire to stay on the field. The speed of the Alabama defense definitely caused problems for Ta’amu and the offense. “I just knew I had to get rid of the ball faster, and I couldn’t hold the ball for long,” he said. “My mentality, as soon as I stepped in the game, I just had to get rid of it fast. They’re pretty good,” Ta’amu added. 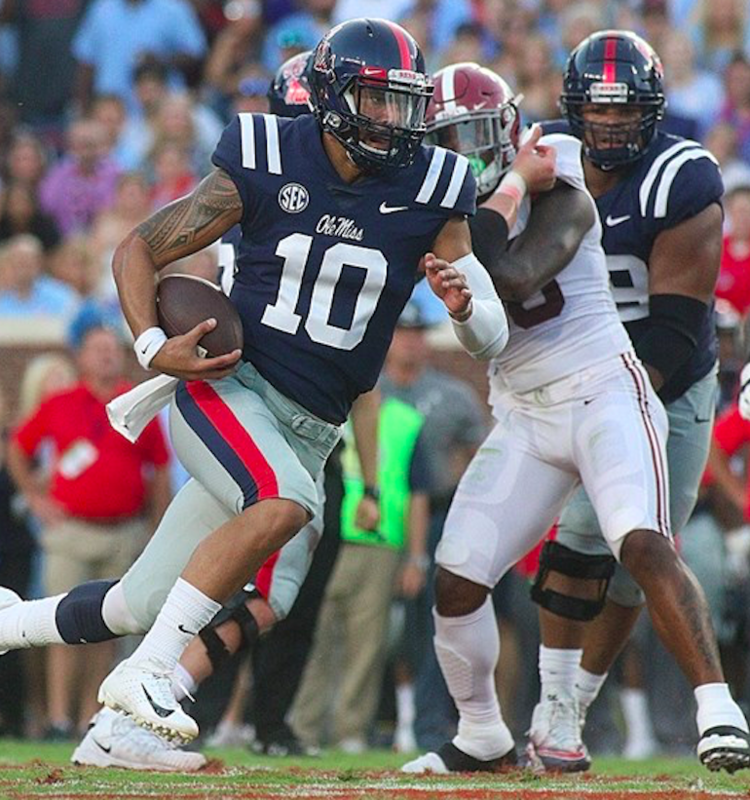 The Rebels’ senior quarterback went on to explain what was taking place. “I tried my best just to throw it over the top,” he said. “They did well just defending our outside receivers. I could have made better throws and given my receivers more chances. It would have turned out a lot different,” he said. Ole Miss takes on Kent State at 11 a.m. next Saturday, September 22, in Vaught-Hemingway. Then, the Rebels will travel to Baton Rouge to face a red-hot LSU team who defeated Auburn, 22-21, Saturday.